Why Did Kim Jong-un's Showcase Band Cancel Their China Show? Whatever the specifics, the cancellation is a case of two powerful leaders — Xi and Kim — clashing. 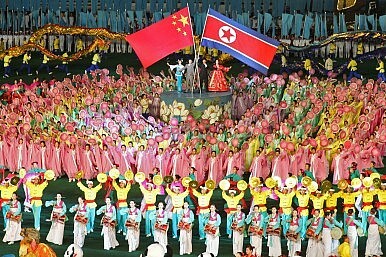 There have been a number of theories about the sudden cancellation of the Beijing performances of the Moranbong Band, an all-female music group in North Korea whose members were handpicked by the country’s supreme leader Kim Jong-un. One theory is that the band was recalled by Kim Jong-un because the Chinese president would not attend the concert as expected. According to one Chinese government official, North Korea initially expected Xi Jinping to attend the concert but found out that instead of Xi, a Politburo member would be the ranking attendee. As a sign of protect, Kim ordered the girl group home over the “Chinese snub.” However, Xi reportedly changed his mind due to Kim’s declaration that his scientists had built a hydrogen bomb, comments made on the same day that the band arrived in Beijing. A different version of the theory is that although Kim had originally expected Xi to attend the concert, North Korea and China reached an agreement that a Politburo member would attend. But due to Kim’s announcement, China decided to downgrade the rank of its attendees from the Politburo level to the vice-ministerial rank — instead of a Politburo member, a vice minister of culture would attend. The problem with these theories is that Kim actually made his H-bomb remarks before Moranbong’s departure from Pyongyang. According to the South Korean state news agency Yonhap, Kim Jong-un made the remarks about the hydrogen bomb during his tour of the Phyongchon Revolutionary Site. But Kim visited the site on December 10, 2015, and the band arrived in Beijing on December 11, due to give its performance on December 12. Another theory focuses on the content of the performance. One version of the theory is that, in one song, the lyrics praised both Chairman Mao of China and Great Leader Kim of North Korea — but considered “Chairman Mao the greatest on the earth” and “Great Leader Kim the greatest in the universe.” Beijing demanded that the lyrics be changed, but Pyongyang refused. Therefore, China decided to cancel the performance. Another variation of this theory is that in a rehearsal, a cadre from the Central Propaganda Department of the Chinese Communist Party discovered that at the end of a series of dances, an image appeared of the mother of Kim Jong-il (and thus Kim Jong-un’s grandmother) holding a baby. In the background was Mount Changbai (in Chinese), known as Mount Paektu (in North Korea) or Mount Baekdu (in South Korea). The picture of Mount Changbai included the entire Heaven Lake (Tianchi in Chinese), a large crater lake atop the mountain. Officially, China recognizes that Mount Changbai is the border between China and North Korea and the two countries share Heaven Lake. But Koreans insist that Mount Paektu or Baekdu, including all of Heaven Lake, belongs to Korea. It is difficult to verify which version of the theory is true. But one thing is clear: this is a clash of strong personalities of two powerful leaders. A princeling by birth, the Chinese president is building up his image as a strong leader domestically and internationally. He does not want to be challenged. Meanwhile, the genuine descendant of the Kim Dynasty, the North Korean supreme leader has been embraced as a great leader of infinite power and wisdom in North Korea. He is feared domestically and is not prepared to negotiate with anyone either. It will be interesting to see what this cancellation –and what it implies about China and North Korea — might mean for the bilateral relationship in the long run.